The 25 peer advocates of Dorset Macmillan Advocacy won the ‘Volunteer Group of the Year’ award at the annual Awards held by the Volunteer Centre Dorset. Every year, Volunteer Centre Dorset holds the Awards Evening to celebrate the outstanding contribution volunteers make across Dorset. This year, the event took place on 26th October 2017 in Dorchester. 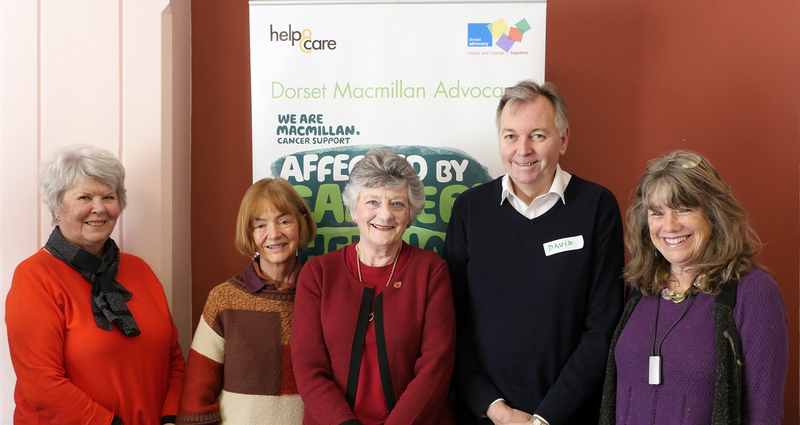 Help & Care nominated the Dorset Macmillan Advocacy peer volunteer advocates for the group award. Our volunteers help people affected by cancer who are aged over 50, as well as their carers or family, in a completely flexible and person-centred approach way. All our volunteers have been personally affected by cancer, either as patients or carers, which makes them have an in-depth understanding of the condition. They demonstrate empathy and give one-to-one support, building a trusting relationship with their partner through listening to concerns and wishes. Peer advocates use their own experience, but do not share it. They are non-judgemental and focus only on the holistic quality of life of their partner. Volunteer advocates provide continuity when the person is seeing many different health and social care professionals. They help their partner to prepare for medical appointments, accompany them and check understanding ensuring that informed choices can be made about treatment and care. The volunteers empower their partners and seek to build their confidence and resilience to promote self-management.